The alleged activities by journalists at the News of the World and other Murdoch owned newspapers means that surveillance and monitoring is a real hot topic at topic at present. Even when carrying out internal monitoring, public and private sector organisations have to be very careful. 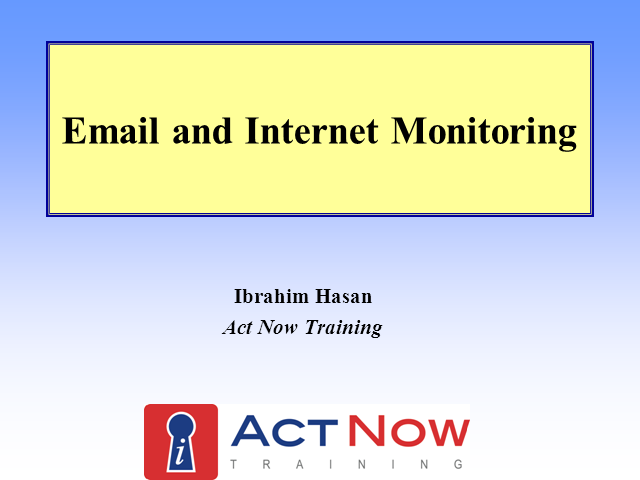 Monitoring and recording of employees’ email, internet and telephone usage (with or without consent) is a particular legal minefield. This seminar provides a thorough examination of the law and practice in this area. We will look in detail at Part 1 of the Regulation of Investigatory Powers Act 2000 (RIPA), the Lawful Business Practice Regulations, the Human Rights Act 1998 and the Data Protection Act 1998. Ibrahim Hasan is a recognised expert on data protection, freedom of information and surveillance law. He is very much in demand as a presenter at courses and conferences throughout the UK and abroad. He has conducted training sessions for many national organisations as well as local authorities and the NHS. Ibrahim’s articles have appeared in many publications including the Local Government Chronicle, Benefits Magazine, IRRV Insight Magazine and Solicitors Journal. He currently writes a regular FOI update column for the Law Society Gazette and is an occassional guest lecturer on the University of Northumbria’s LLM in Information Rights Law.